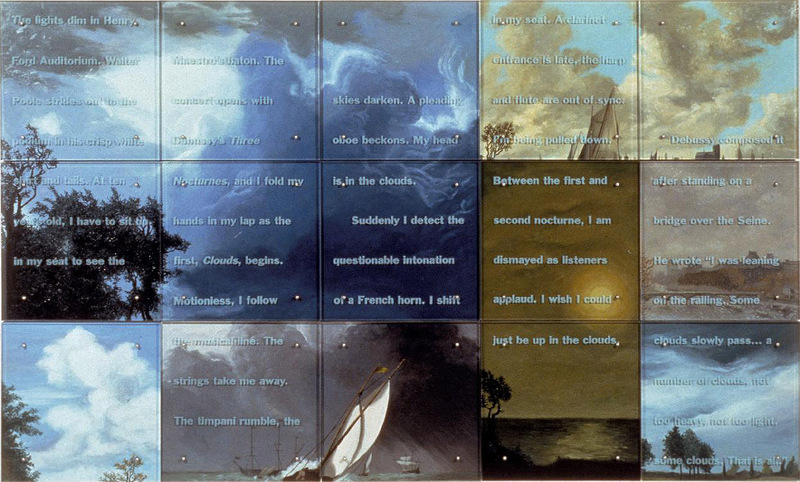 ALL THE WORKS FROM 1997 WERE INCLUDED IN THE EXHBITION, Ken Aptekar: Talking to Pictures, at the Corcoran Gallery of Art, Washington, D.C., October 17, 1997–April 5, 1998. 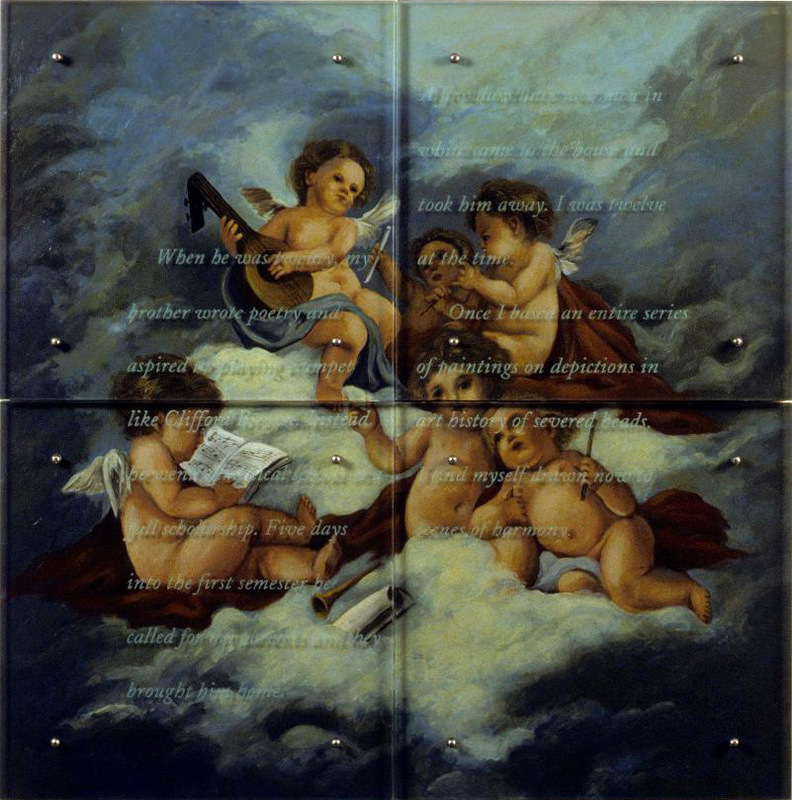 Click HERE for installation views. 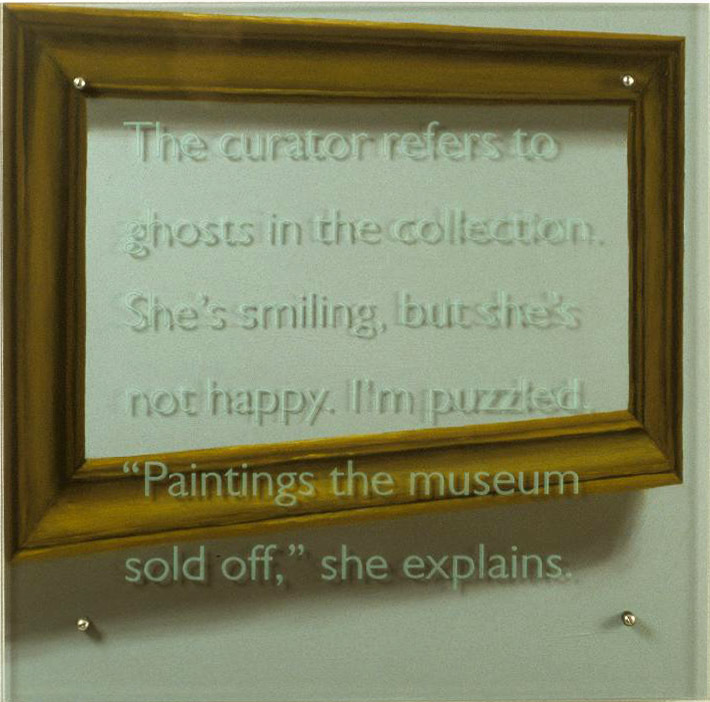 Text: The curator refers to ghosts in the collection. She’s smiling, but she’s not happy. I’m puzzled. 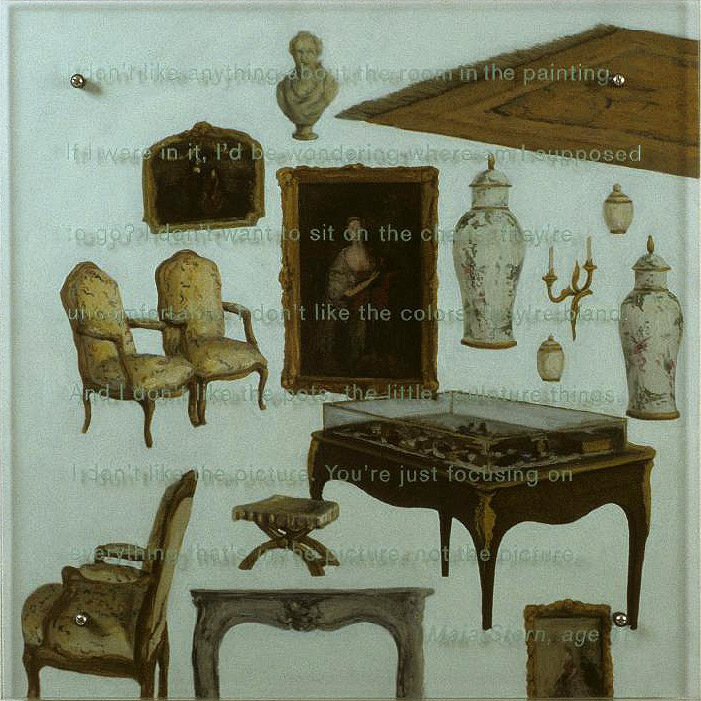 “Paintings the museum sold off,” she explains. over the backyard in Detroit. The sun is hotter, too. Even in the water I have to wear a t-shirt. deprive him of that. For me personally, it’s like, whatever floats your boat. money he made teaching plus moonlighting as a musician. he looks like a movie star. My mother had the sweet looks of an angel. Text: Her father dragged her from shtetl to shtetl. She sewed clothes for Jews in the back of a horsedrawn cart. 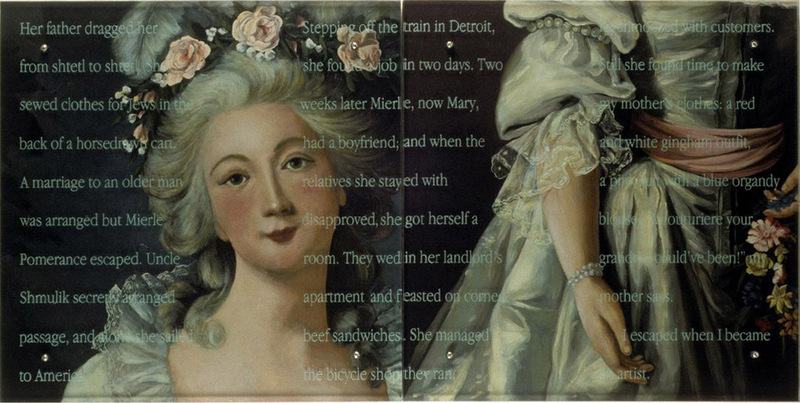 Mierle, now Mary, had a boyfriend; and when the relatives she stayed with disapproved, she got herself a room. escaped when I became an artist. 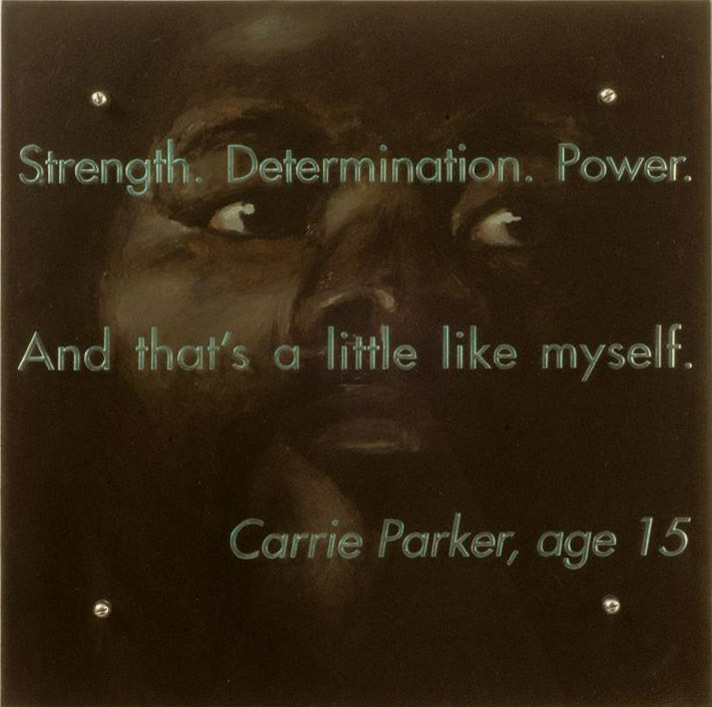 be something like his father was.” She doesn’t know his father was an artist. picture won’t come out backwards. It’s all up to me how big to make my pictures. Often I am all alone in the dark while I’m developing. 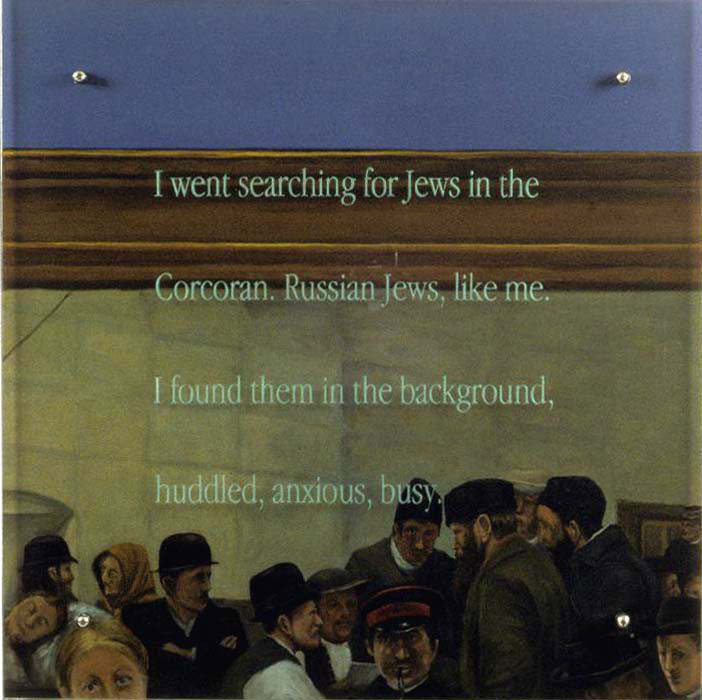 Text: I went searching for Jews in the Corcoran. Russian Jews, like me. I found them in the background, huddled, anxious, busy. Text: She needed help. Her husbandÕs medical bills were more than she could manage. 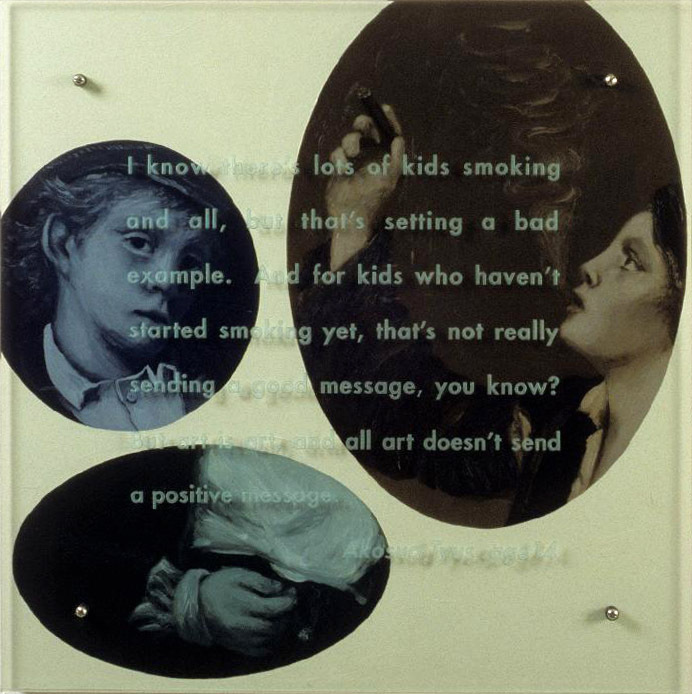 John Fitch, of the Artists Fund Society, wrote to the Corcoran Gallery of Art. “Mr. Harry Chase, a member of our Society, has been for several years an inmate in an Insane Hospital. . . . I have taken charge of his studio and pictures and am selling all I can to enable his wife to pay all his expenses. 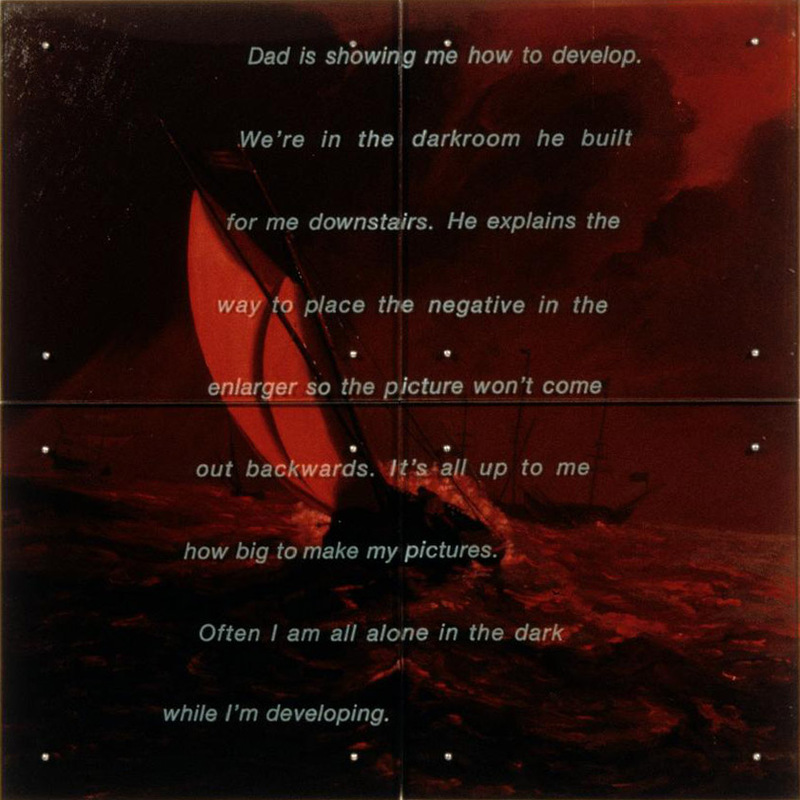 Mr. Chase was generally acknowledged as the most promising American marine painter, and all who knew him and his works sincerely mourn that the prospect of his recovery is a very slight one. I would like to offer New York Harbor for exhibition and purchase.” The Corcoran bought the painting for one thousand dollars. Chase died later that year, 1889, at age 36. Text: My parents take us on trips. The four kids pile in the car. Often when we’re driving, I press my forehead to the window. Sometimes birds perch on telephone wires along the road, and I fly up and sit quietly beside them. They’re just there; they have nothing to figure out, no one to escape. 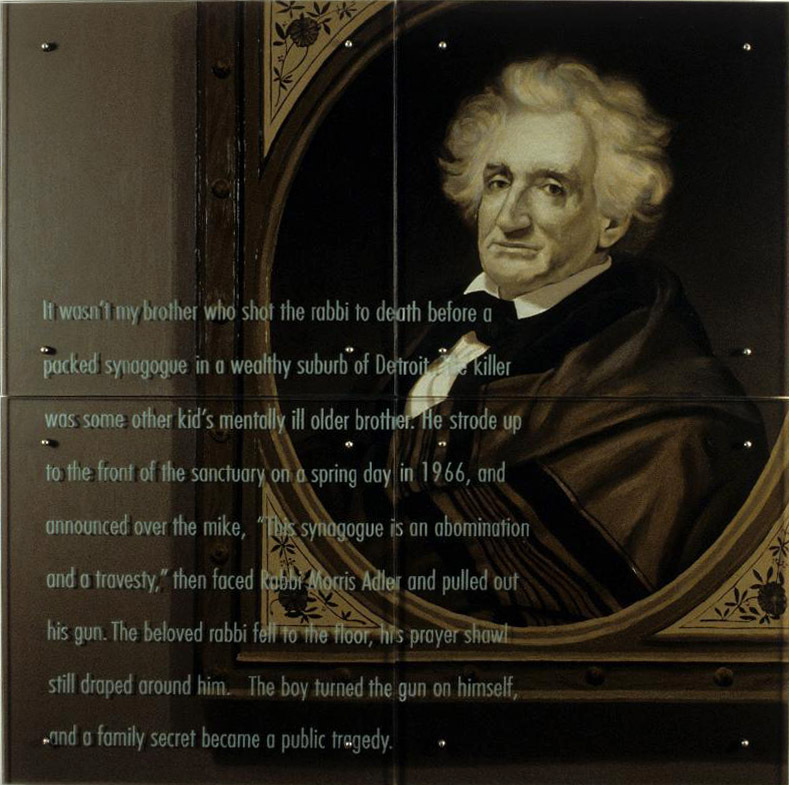 Text: It wasn’t my brother who shot the rabbi to death before a packed synagogue in a wealthy suburb of Detroit. The killer was some other kid’s mentally ill older brother. He strode up to the front of the sanctuary on that spring day in 1966, announced over the mike, “This synagogue is an abomination and a travesty,” then faced Rabbi Morris Adler and pulled out his gun. The beloved rabbi fell to the floor, his prayer shawl still draped around him. The boy turned the gun on himself, and a family secret became a public tragedy. 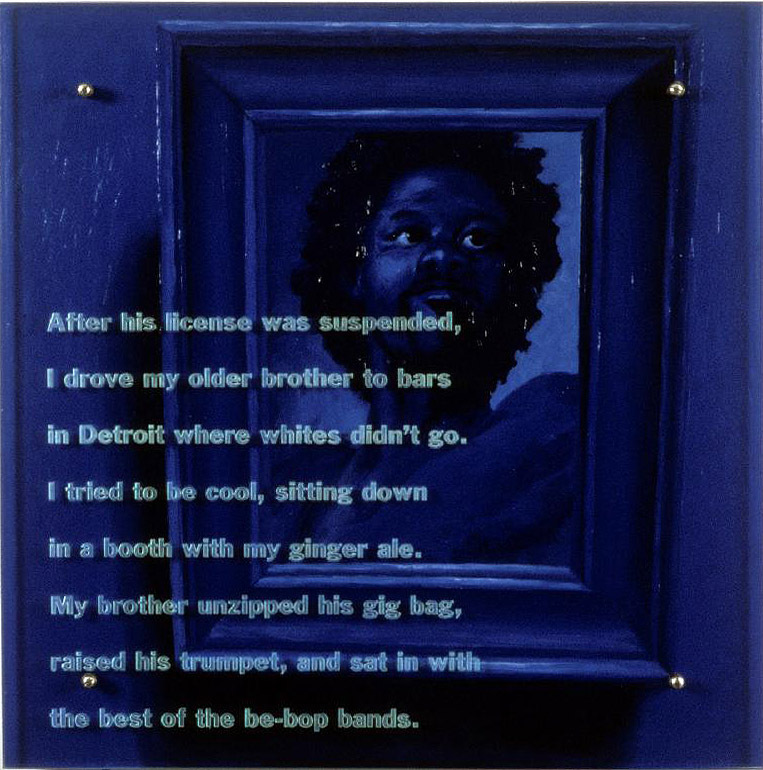 Text: After his license was suspended, I drove my older brother to bars in Detroit where whites didnÕt go. I tried to be cool, sitting down in a booth with my ginger ale. My brother unzipped his gig bag, raised his trumpet, and sat in with the best of the be-bop bands. 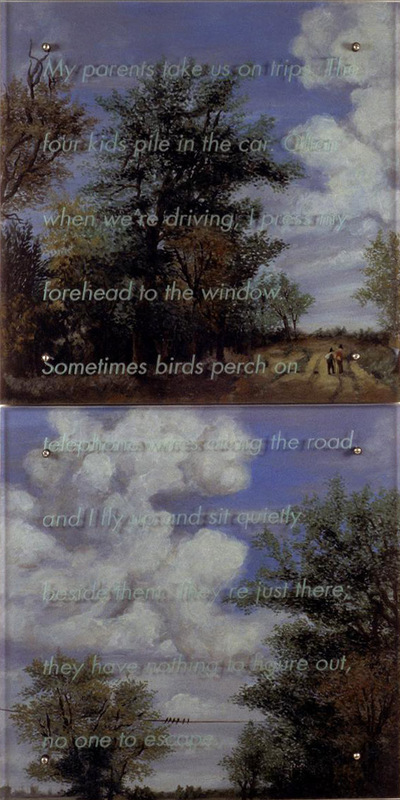 Text: Is the sky blue? What kind of blue? Would I think twice about the clouds? I can’t tell from a photograph of the painting. 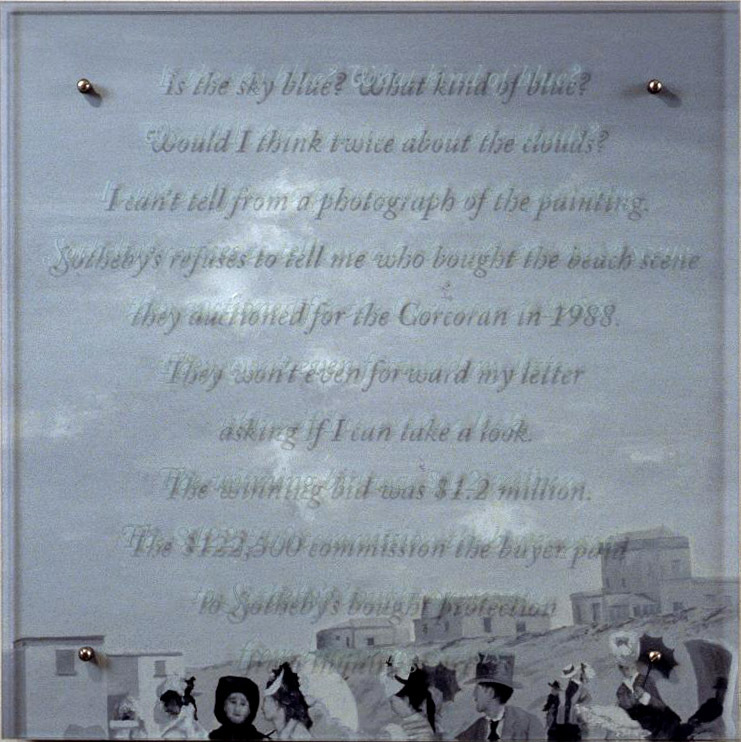 Sotheby’s refuses to tell me who bought the beach scene they auctioned for the Corcoran in 1988. They won’t even forward my letter asking if I can take a look. The winning bid was $1.2 million. 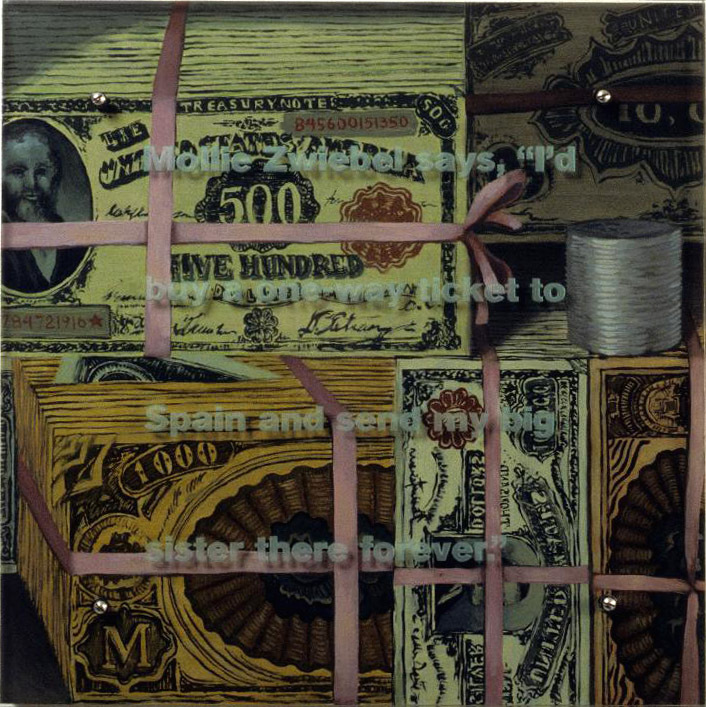 The $122,500 commission the buyer paid Sotheby’s bought protection from inquiring artists. 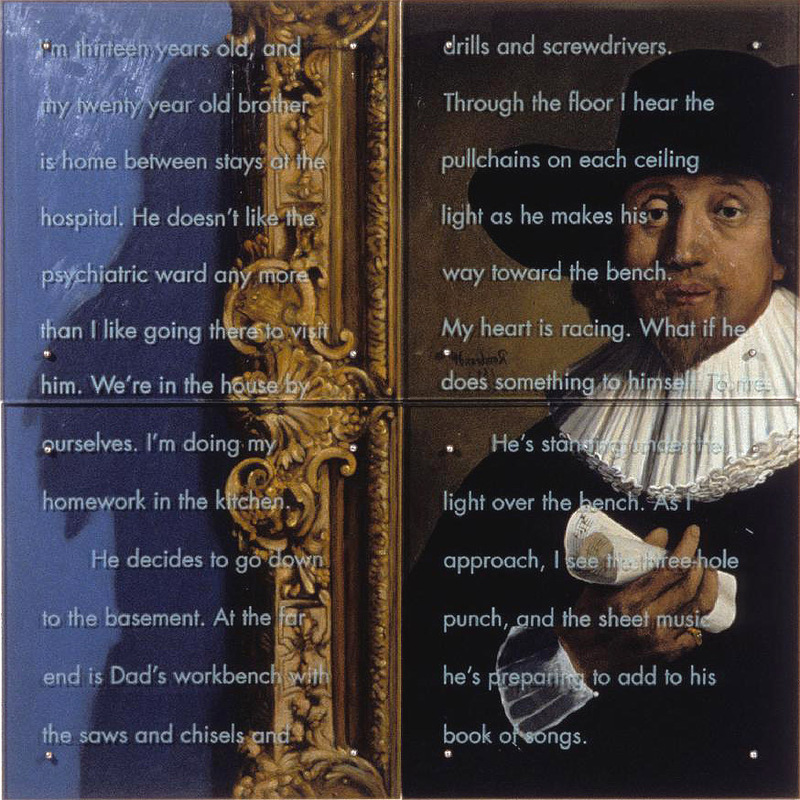 Text: “Is that you?” the art student asks. 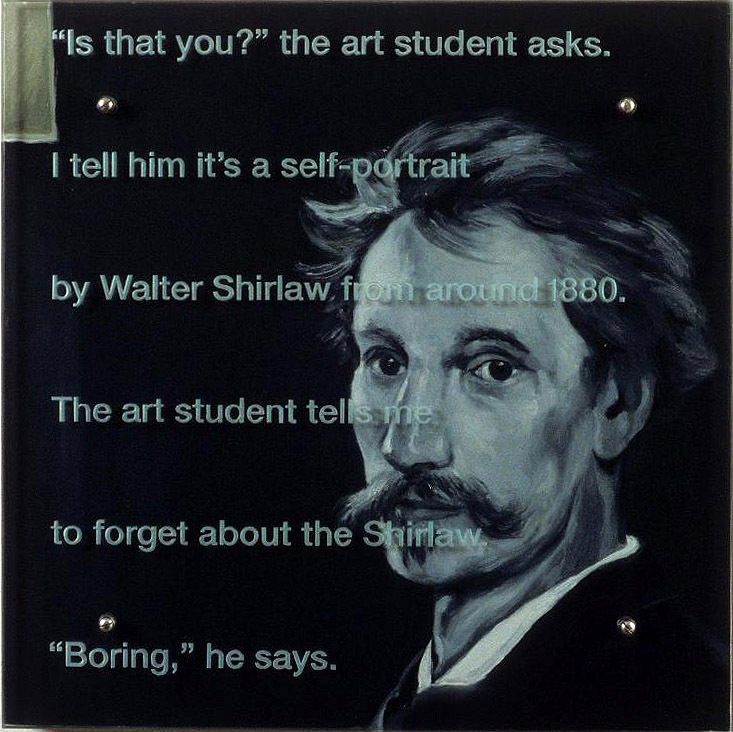 I tell him it’s a self-portrait by Walter Shirlaw from around 1880. The art student tells me to forget about the Shirlaw. “Boring,” he says. Text: I’m practicing. Dad’s in the other room, but I know he is listening. He cares about how I play the piano. Later my Russian grandmother is sitting on the couch. I’m playing Oyfin Pripetshik for her. I see her lips moving to the Yiddish lyrics she learned in a village near Minsk sixty years ago. My grandma died in 1982. I don’t play piano much anymore. Text: When he was twenty, my brother wrote poetry and aspired to playing trumpet like Clifford Brown. Instead he went to medical school on a full scholarship. Five days into the first semester he called for my parents and they brought him home. A few days later two men in white came to the house and took him away. I was twelve at the time. Once I based an entire series of paintings on depictions in art history of severed heads. I find myself drawn now to scenes of harmony. Text: I’m thirteen years old, and my twenty year old brother is home between stays at the hospital. He doesn’t like the psychiatric ward any more than I like going there to visit him. We’re in the house by ourselves. I’m doing my homework in the kitchen. He decides to go down to the basement. At the far end is Dad’s workbench with the saws and chisels and drills and screwdrivers. Through the floor I hear the pullchains on each ceiling light as he makes his way toward the bench. My heart is racing. What if he does something to himself. To me. He’s standing under the light over the bench. As I approach, I see the three-hole punch, and the sheet music he’s preparing to add to his book of songs. Text: Before you died, you said art was your “ticket to immortality.” You gave the Corcoran a million dollars and some Daumier etchings you had promised to the Los Angeles County Museum. You also threw in a big portrait of yourself. 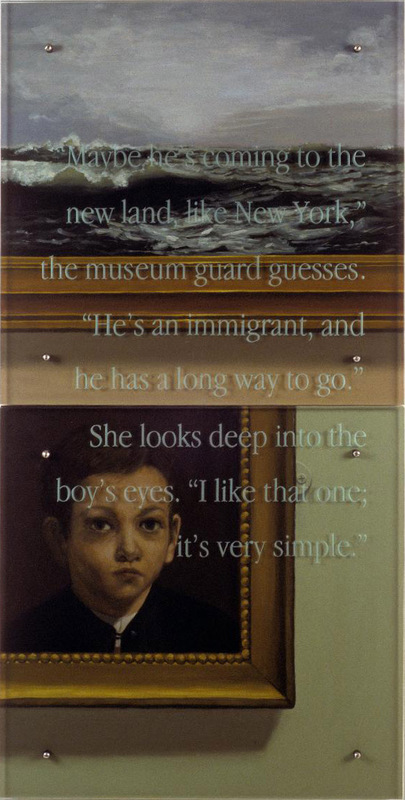 It was never exhibited at the Corcoran. 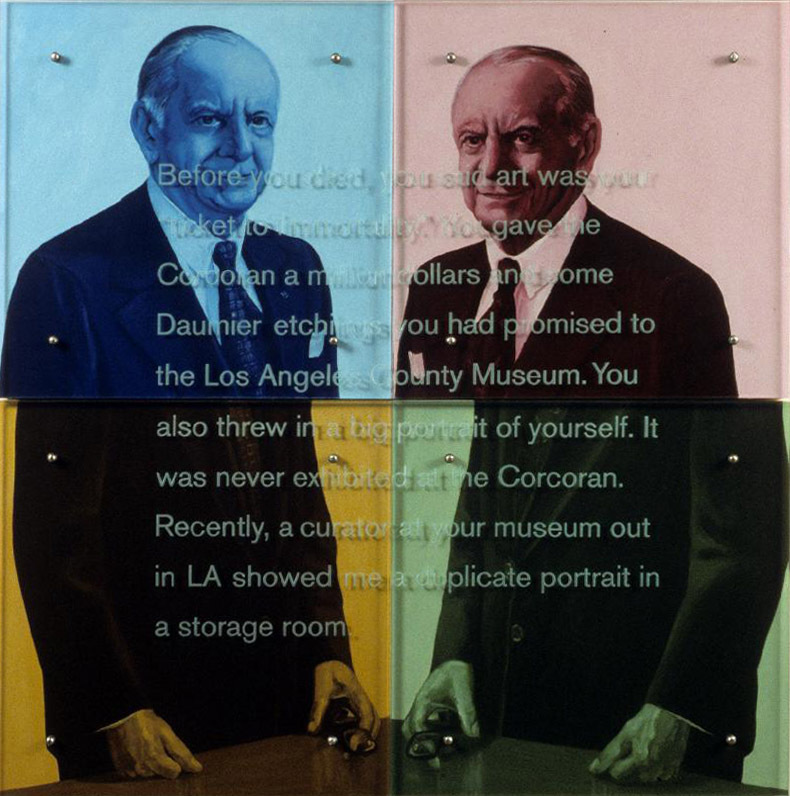 Recently, a curator at your museum out in LA showed me a duplicate portrait in a storage room. 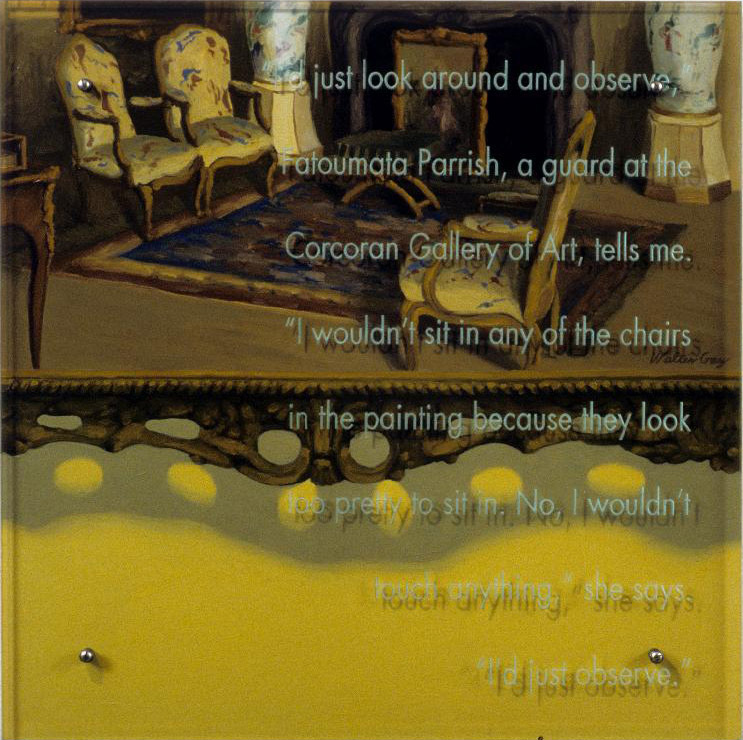 Text: From Darnell Hester, a guard in the Corcoran: The gentleman seems like the kind of person I wouldn’t want to know. I wouldn’t trust him any further than I could see him. 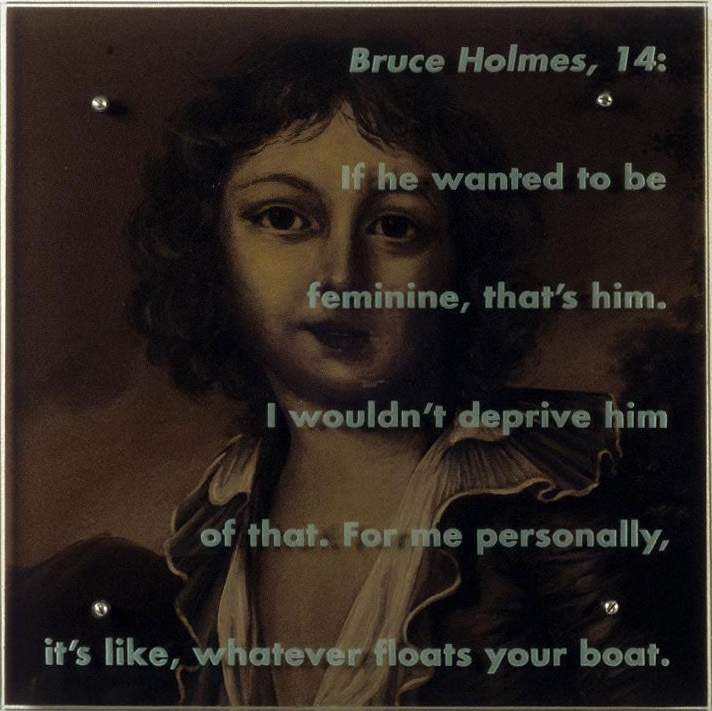 That’s what I appreciate about the painting, the fact that it does arouse that type of emotion in me. 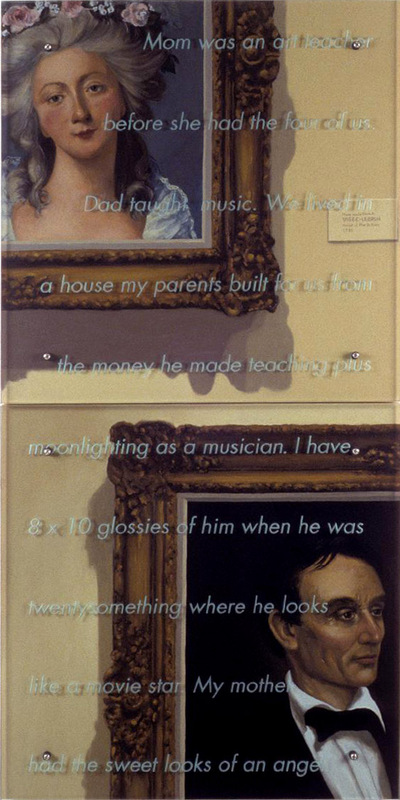 Text: I call the Metropolitan Museum of Art in New York. Would it be possible, I’m wondering, to arrange the loan of his wife of forty years to sit beside him in Washington for an exhibition? 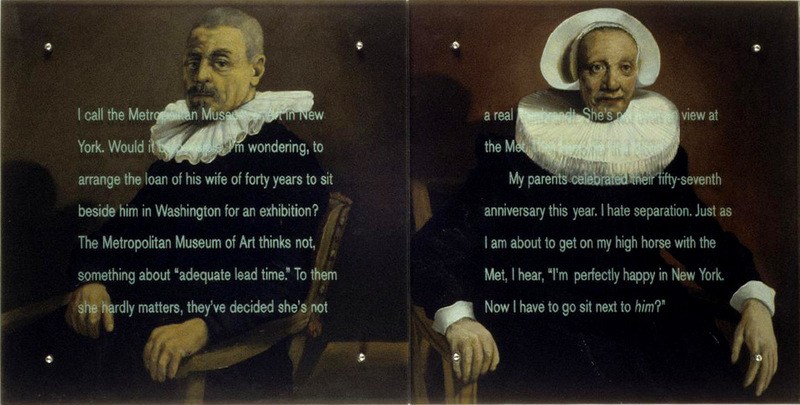 The Metropolitan Museum of Art thinks not, something about “adequate lead time.” To them she hardly matters, they’ve decided she’s not a real Rembrandt. She’s not even on view at the Met. They keep her in a closet. Text: My parents offer to help me buy a computer and scanner to work on my paintings. I get one with a 500 megabyte hard drive, which seems enormous. My studio is in the living room. So is the dining table, my desk, and a sitting area. I donÕt have much space to work. 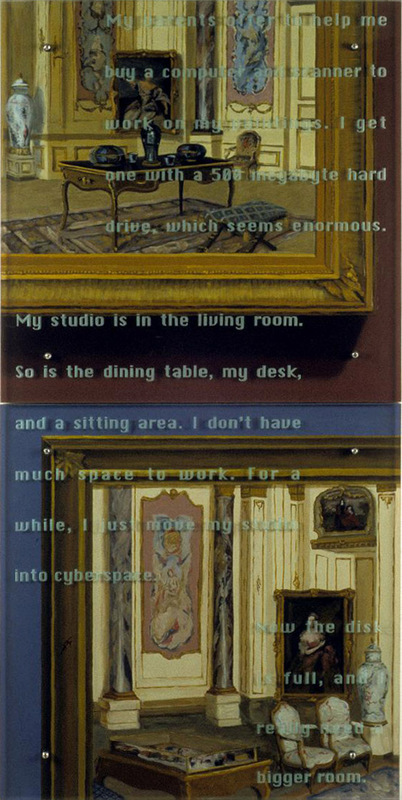 For a while, I just move my studio into cyberspace. Now the disk is full, and I really need a bigger room. Jan Van Goyen, View of Dordrecht (from the North) 165?